Let’s look at the numbers. Within five years of the construction’s inception, more than 45,000 people from Panama, the United States, Europe, Asia, and the West Indies labored on this project. This was Crowdsourcing at its source–human beings. 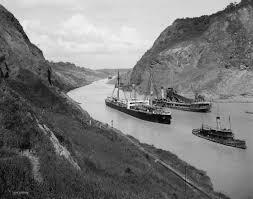 Their combined work created a masterpiece, and as I stated in a previous blog, “We are, together, greater than who we are as one.” The Panama Canal was such a feat, it is considered one of the Seven Wonders of the Modern World. It took over ten years to build spanning from 1904-1914, almost one hundred years old. So why am I harping on a feat of engineering a century old? Because we can learn something from it. The world saw a problem and the world found a solution. In order to do so, a new road had to be forged, new and forward thinking needed to occur. The world pooled their brains and they found a solution. Is the connection between the Atlantic and the Pacific more important than the connection between the students in our classrooms and the classrooms of the world? Why are we circumventing the truth? We need to build the canal. We need a new lens in education, we need new thinking, and we need new solutions to problems–and we have all of those things–or at least we have the ability to get all those things if we allow it. If we allow ourselves to take the risks, we will give our students what they need. And what they need is another basic right. In fact what we need is an amendment to the Constitution of Education. An Eleventh Amendment. An Unalienable Right to be Connected. It is a right not a privileged, and we, as educators, must go to battle to secure that right. There are vast quantities of knowledge available if we can get to it. I am consistently aware of the chasm between the possibilities of the what-can-be to the what-is actually happening in practice. There is a large gap, and it is greater than the Digital Divide. I am thinking about the ever-so-slow, snail’s pace of change demonstrated by educational institutions. Our students need to be connected. They live in a global world. They will not thrive in the future if they do not have the skills and the comfort level in how to connect intellectually, and with a purpose to the outside world. There are so many reasons supporting why our students should be connected, but yet, they are not-at least not routinely as a matter of practice. And that, in my opinion, is a violation of their rights. I am relatively new to the connected world and am not afraid or embarrassed to admit that, but I will also admit that I have consumed the Kool-Aid. I can see the what the world of education needs to be. And I am mired in the muck of what the world of education currently is. In the short time that I have been living the connected life, I have built a website, developed Wikis, become a blogger, developed a PLN, worship Twitter. I have met people without ever meeting them. I have shared information with people whose faces I have never seen. I have a community that spans coast to coast in the United States and reaches way-down-under. I cannot imagine living any other way. So when I reach out to connect my students and am thwarted because the practices in school do not match the vision, I am stunned. When the very institutions that need to be preparing our children for success in the future are impeding their progress, I am stunned. When the students are more connected the minute they step outside the door of the school than when they are inside, I am stunned. When the potential for a connected-education day ends at the end of the day without the connection, I am stunned. But not so stunned that I am thrown into a catatonic state–but stunned enough to throw me into a state of action. It is almost Election Day. I am going for a rapid fire campaign blowout to secure our students’ rights to be connected.